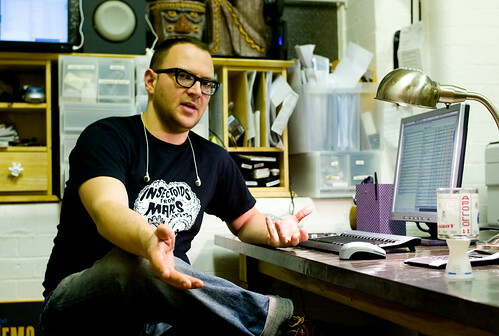 Cory Doctorow is a writer, blogger, and futurist who has embraced the ideals of Creative Commons from the beginning. Cory Doctorow is a Science Fiction author with a vast amount of work under his name. Cory, as a very early adopter of Creative Commons, has been producing Creative Commons licensed works since 2003 with the publication of the first CC licensed novel Down and Out in the Magic Kingdom. Along with writing SciFi, Cory is one of the editors of Boing Boing, an award wining blog covering a wide range of topics from technological gadgets, to steampunk tricycles, to current information policy debates. Cory Doctorow's literary works are released under Creative Commons Atrribution NonCommercial ShareAlike or Attribution NonCommercial NoDerivatives. His latest work, Little Brother, has spent 4 weeks on the NYTimes bestseller list and is released as BY-NC-SA. One of a number of XKCD comics where Cory Doctorow is mentioned. This page was last edited on 1 January 2013, at 18:04.